Jorn Ostby will be the Sales Director for Lundhs from 1st August, 2017. At the same time, Marius Withbro-Svendsen will take responsibility for the area of Business Development. CEO of Lundhs, Thor-Anders Lundh Haakestad is delighted that both Jorn and Marius have accepted the responsibility for these areas. 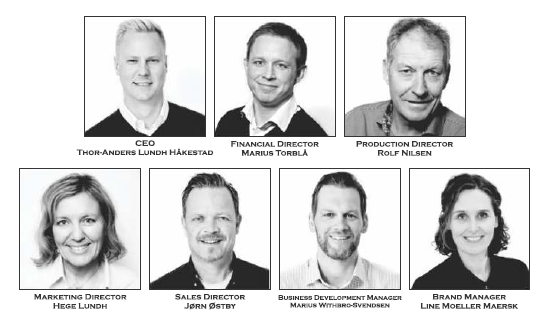 She is also pleased to see that the team would benefit from John-Petter Gundersen's competence and experience as he continues as an important contributor in the sales department. Lundhs is the leading producer and exporter of natural stone in Northern Europe. Lundhs was founded by Thor Lundh in 1962 and is today owned by the Lundh and Treschow families. Larvikite from Lundhs can be seen in many well-known landmarks all around the world. The material is exported all over the world. Largest markets are China, Italy, India, Spain and Vietnam. The most popular materials are LUNDHS Blue (the original Blue Pearl) and LUNDHS Emerald (the original Emerald Pearl), both Larvikites, only found in the areas surrounding Larvik in the south of Norway. In India the most popular Lundhs materials are also LUNDHS Blue and LUNDHS Emerald, but also LUNDHS Marina, LUNDHS Antique and LUNDHS Royal are doing well in the Indian market. LUNDHS Ocean is quite new in India, but has been received well - and is growing in demand. This material is particularly good for large projects as it is possible to cut the stone in both directions and get the same look. This way the project owners can maximise the utilization to its fullest.